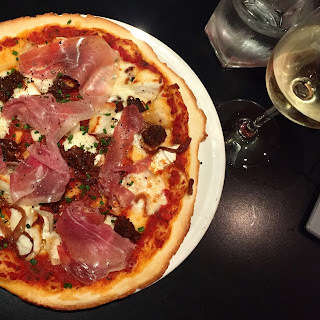 Woaaahh it’s that time of the month again – monthly favourites round up. 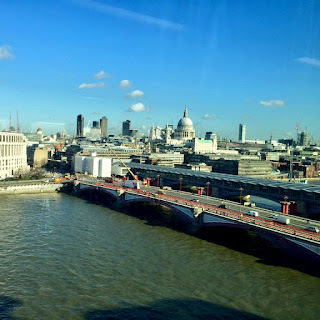 This month has flown by despite being a day longer this year, but here’s some of my highlights, including things to do in London from my more recent posts and celebrating my Grandma’s 90th Birthday! 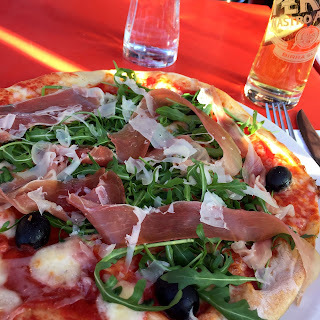 1/ Pizza – I ended up going for a pizza for one in Manchester earlier in the month. Headed to Dough after a number of recommendations from friends. Had the Goats Cheese pizza with added prosciutto ham. A glass of wine and a griping read on my kindle kept me entertained over dinner with me, myself and I. A couple of weeks later I enjoyed company with my pizza from Gourmet Pizza Company, as Abby, Emily and I enjoyed a luxurious Friday lunchtime on the South Bank. 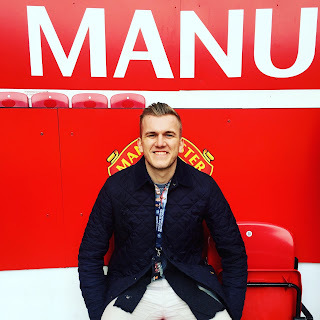 2/ The reason I visited Manchester was part of Lee’s christmas present – a tour around Old Trafford. Despite my usual resent towards football (I’m currently sat with fifa on in the background and an afternoon of football on the TV ahead) it was surprisingly interesting. I had no idea how successful Ryan Giggs is and the tunnel of glory which showcases ManU’s treble win in 1999 was great – seeing the team win over and over on the TV clips was pretty exciting! We headed down the players tunnel – Lee’s excitement was through the roof haha! 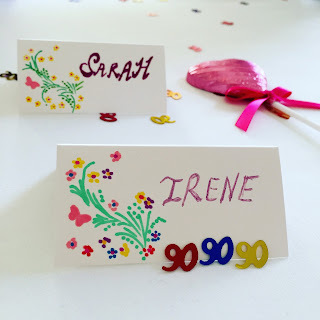 3/ The family and I celebrated my Grandma’s 90th Birthday meal on Valentines day – 18 of us gathered around the table for a meal. Check out some of the photos and things that happened 90 years ago on this post. 4/ As you all probably know, trying different food is my weekly highlight. This delicious greek wrap was available at the South Bank food market – which had been set up during half term for all the little kiddies that were in their masses on South Bank with mums and dads. Pork meat with salad, tzatziki and feta sauce. 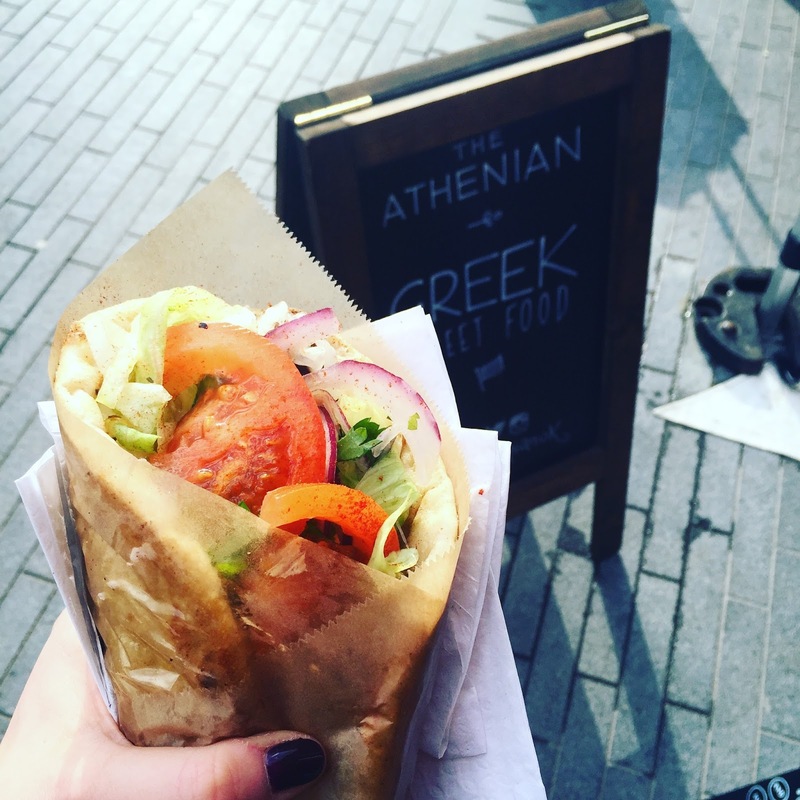 I then saw the same stand at Brick Lane market last Sunday – so no doubt you can catch them all over London! 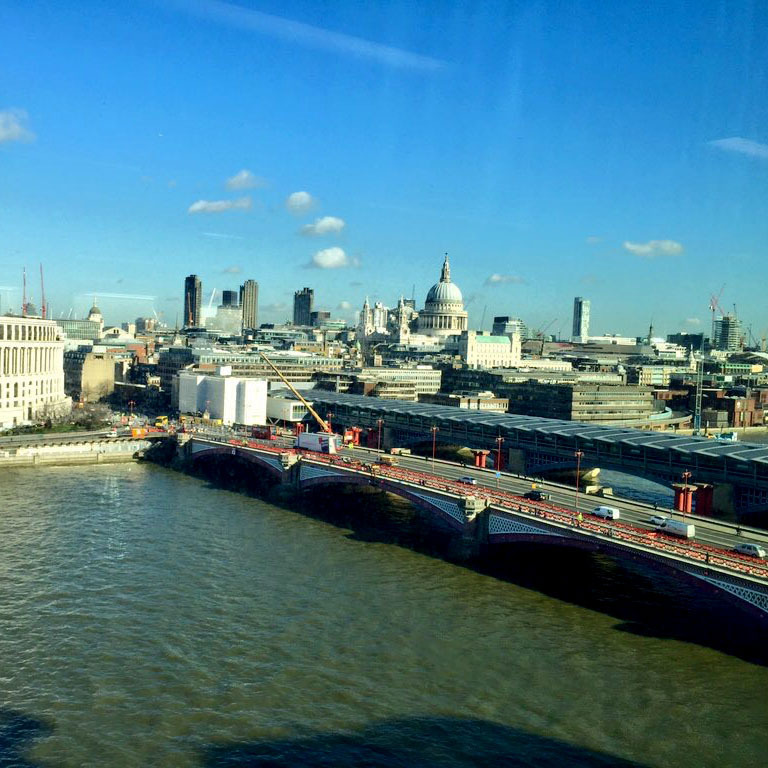 5/ Summer’s coming – gorgeous blue skies finally over the river this month. Can’t wait for more views like this over the coming months. 6/ This photo of Carnaby Street from last Friday was a big hit on my instagram! 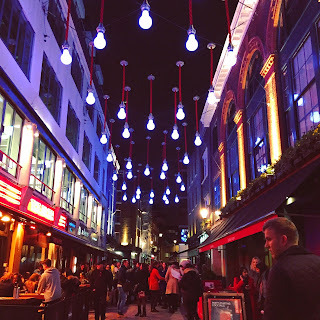 I love that this area of London always have fantastic decorations no matter the time of year. The Christmas ones were impressive but I loved these little hanging lightbulbs. How was your February? Get upto anything fun?